Teach Me How To Eddie! Sometimes when I have a few minutes of downtime, I toy around with trying to do the Eddie Van Halen tremolo technique. This is the awesomely beautiful and deservedly famous pure forearm rotation motion Ed uses for the famous Kreutzer etude section in Eruption, and for the mesmerizing tremolo section in the acoustic “Little Guitars” intro. And that was as much as I cared to look into it. Instead, attempting to do this was more of a fun time-killing game. Every few months, whenever it occurred to me, I’d give it the old college try for five or ten minutes before getting bored and going off to do the laundry. What was tantalizing about this is that I could always do something that looked like the motion in the air, as a mime. I’ve done this several times in lessons while discussing picking motion. But I could never do it on an actual guitar, with a pick in my hand, while playing a note. Something about the coordination would always feel strangely off, and I couldn’t even get the motion going. Then one day about three or four months ago, I picked up a guitar, and for whatever random reason, it clicked. But only briefly. And just as soon as I could do it, I couldn’t. The hands just seized up and stopped. This is usually how it goes when you’re learning a new picking motion. Some attempts you’ll get it, but only for a few seconds. Other attempts just crash. Some days you won’t be able to do it at all. It’s like a TV signal cutting in and out. On the days when I’m simply not getting the reception, I just stop. I put the guitar down and do something else. Common wisdom sometimes suggests that “tremolo motions” can’t be used this way, but there is no such thing as a tremolo-only motion. There are just picking motions, and they can be used for anything you like, once you are aware of their string-switching capabilities. 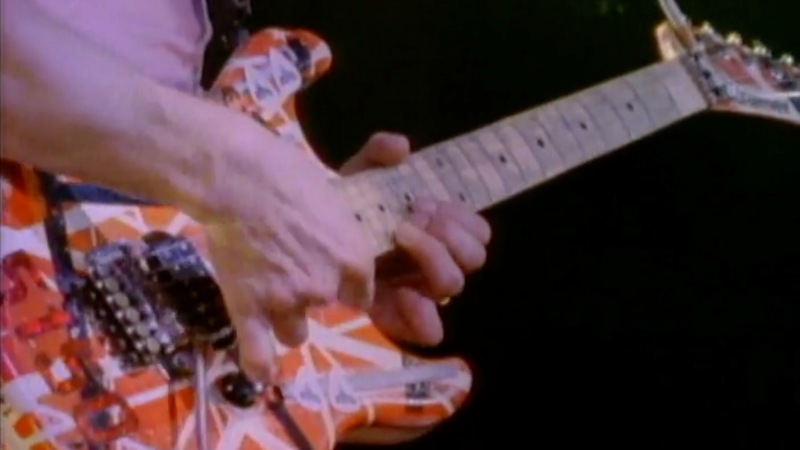 In the specific case of the EVH forearm rotation technique, it’s an upstroke escape motion, which means that string changes can only happen when the final note on the string is an upstroke. This is how Eddie changes strings in the “Little Guitars” intro, so right away you know that this motion actually can be used to play lines that move cleanly across the strings. The evidence was right there all along. My attempts at this are a little sloppy, of course, as you can see in the second clip above. I bang into strings I’m not intending to play, sounding random noises. The rhythm is off. The fretting is sometimes even off on the ascending sixes phrase, even though I’ve played that line a million times. After all, you only have one brain and everything is connected. When the picking hand is disorganized, everything gets a little broken. And indeed, you can see that the motion still stops and starts in occasional fits of freezing. This is what motions look like when you’re still learning them. They’re uncoordinated and a little wild, and the whole thing doesn’t feel uniformly smooth. Your brain is still figuring out how to wire the connection for longer durations and greater consistency and smoothness. As you search for that realistic and sloppy zone, you may still feel “tension”. That’s normal. You don’t yet know which muscles you’re supposed to use, or if you do, you don’t yet know what it feels like when you use only those muscles. So you’re probably going to overcompensate by using… them all! You can see in the infographic above that there is some bicep involved in the supination phase of the motion — those are the muscles labeled in red. But the muscles responsible for the pronation phase of the motion, labeled in green, are all forearm muscles. So that’s where you’re going to feel the muscular effort, if anywhere, when you do this right. So, for example, if you feel the tricep contracting hard, you’re either doing the motion wrong, or over-doing it. So you stop for a minute, adjust your arm position, and try again. Maybe try doing the motion in the air as I initially did. That was the precursor in my case to being able to do it on the guitar, and it always felt nice and smooth. I often describe the process of learning a picking motion as the relentless “search for easy”. With repeated attempts to find the “easy”, I am now likely to get the motion going smoothly at least half the time I sit down to try it. In fact, during moments like the first studio clip, above, I can actually do the motion at approximately the same speed as Eddie’s famous “Live Without A Net” guitar solo, a section of which I’ve included in the clip. For reference, Ed is picking at about 210 beats per minute sixteenth notes in that section. While that’s certainly fast, I was surprised it wasn’t even faster, because it sounds blazing. The likely reason is fluidity. Ed is butter smooth. The motion appears effortless for him. When Eddie’s on, he can seemingly do it all day. By contrast, I always feel like I’m on the verge of falling off the bicycle just as I get going. What this tells me that I when I really figure out how this works, I’ll probably be able to do it a touch faster, and like Eddie, with even less effort and for longer durations. And that’s just it. When it comes to learning motions, I have never, in decades of guitar playing, worked a motion up to speed in small increments. Instead, most technical breakthroughs were instant and unexpected, close to the realistic speed at which you would actually use the motion in real-world playing, just much sloppier and briefer until I figured out how to smooth-ify and accurize them. I made those words up! 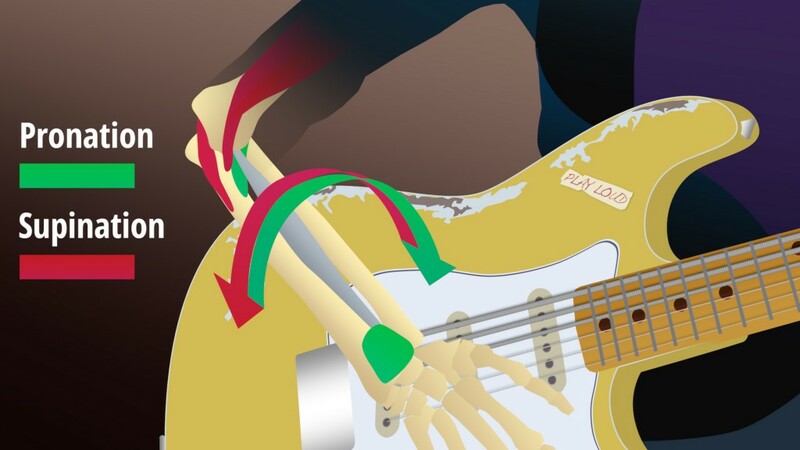 Have you ever experimented with Eddie’s legendary forearm-rotation picking movement? I’m pretty sure there are lots of Cracking the Code viewers who can do it faster and more smoothly than I can. Get on the forum and show us your Eddie! Pursuant to our various discussions on learning picking motions, here’s some fun stuff on the legendary, awesome Eddie Van Halen tremolo technique. It’s not really a tremolo technique, of course — you can also use it to switch strings, as Eddie does on “Little Guitars”, and as I do in the practice footage I’ve included with the blog post. Very generally speaking, this is how I work on motions. I get them going at or near their realistic speed, accuracy be damned, trying to find that click where it gets smooth, as an indicator that I’m doing it right. I’ve never had success trying to start super slow, and this motion is a great example of that. When you do this really slowly it feels super awkward and overly twisty / turny. It feels like a lot of mass is swinging around and it doesn’t want to go faster. Instead, a much better way to get this is to do it in the air with no guitar, fast and lightly, until it feels smooth and looks realistic to what Ed does. That’s step one. Then you try and translate that smoothness to the guitar. I’ve put up some practice footage of tooling around with using this to play single-note lines. This is typically how I work stuff out — just banging around really sloppily, trying to get things to look realistic, occasionally hitting notes right. It’s not about tempo. In fact I find metronomes super distracting at this early point in the process. It’s like a little drill sergeant yelling at me to go go go, and it makes it hard to focus on the coordination. I like stopping and starting, I like trying different tempos, or not worrying about tempo at all. I like an unstructured playful atmosphere. And I don’t like doing this for more than twenty minutes or something, or I get bored. More thoughts in the blog post. More importantly: Show us your Eddie! I know @alexvollmer does a badass Eddie. Who else has got it? I’ve messed with this on and off since October or so. I can’t get it to work properly outside of creating a “buzzsaw” effect for single-note lines. It sounds more aggressive than my normal playing and I think it works great for extreme music. I learned to do it with my left-hand first, I have no idea why. You can hear the “drop out” pretty significantly here. In a live setting no one would care but it’s very apparent solo. I have put no time into this and it’s fairly frustrating to practice - there’s that constant need to make sure the pick hits the string. I don’t think there’s any movement save rotation. That’s awesome! That’s about 225 - 240bpm and I don’t think it sounds buzzsaw at all, I think it sounds pretty great. I’d use the hell out of that motion. Especially for descending lines where muting isn’t as much of a concern. I think there are a lot of people who’d like to have a picking motion that works that well. There’s still some variation in the motion which is probably why you think you need to monitor the “missing the string” problem, but I don’t think that’s down to the motion, it’s down to not having it totally smooth yet. I’d definitely come back to that every so often until it smooths out. Nice work here. Great observation. I can do it at all speeds below the maximum, BUT — and I think this is the key — I had to get it at (or near) the maximum to know what the correct form was, so that I could then slow it down. If I went the other way, I could do it slowly but couldn’t speed it up, because I hadn’t hit upon the efficient form. Speed is the test for efficiency. Related to this, I think one reason why people think that this is a “high-speed-only, tremolo-only technique”, and can’t be synchronized, is because it’s easy enough to figure this out even for a player who is a total beginner. Even if you’re new to guitar, but you can move your hand around in the air, you might just be able to figure this one out, at the highest speed where the smoothness is most obvious and easily gettable. In other words, doing this motion fast on a simple one-note, one-string phrase, is the first step to getting it. It’s not surprising that a beginner would make it to step one, but not steps two, three, and so forth, which involve knowledge and experience with hand synchronization and string switching mechanics. I’m not referring to you, of course! I’m referring to what I imagine were hordes of kids in the '80s who probably were able to figure this out in their bedrooms but didn’t have much other picking technique beyond this. Ha! I was totally one of those kids. The first time I saw Ed do this thing was watching Live Without a Net on a VHS tape I borrowed from a friend. I had been playing for a few years and when I saw the clip you “quoted” in your video, my head exploded. Fast-forward 25+ years and I think I might be starting to grok how it works. Previous PostDo You Need To Practice 8 Hours A Day? Next PostThe Pickslanting Primer, Now With 100% More Grip!